Target audience: Educators, entrepreneurs, app developers, family members, iPad owners. At the first Launch Education and Kids held this week at Microsoft’s Silicon Valley outpost in Mountain View, VC/entrepreneur Jason Calacanis launched a new conference series that showcased 30 inventive startups — some of which will likely change the face of education or learning games for kids. Or both. The most interesting person I met was Semira Rahemtulla, CEO and co-founder of a cool new tablet app called PlayTell. The San Francisco-based startup on Tuesday launched the private beta of its new app, currently available for the iPad, which lets loved ones share a reading experience over the Internet. Grandmas and grandkids, aunts and nephews, soldiers and young children, you now have a way to experience reading a book together online, even if you’re thousands of miles apart. PlayTell (tagline: “Play together, even when you’re apart”) lets you read a book with your loved ones while you’re in a video chat. While we grown-ups use GoToWebinar or WebEx for collaborating online over business, until now there wasn’t a way for families to share reading materials at the same time, and then to capture their shared experience through photos or video (a feature coming in a few weeks). The reading catalog is understandably small at this early date, but it will grow over time as libraries and book publishers come on board. Check out my 5-minute interview with Semira (conducted, by the way, in a very noisy hallway without a tripod). She had some wonderful insights about how children as young as 2 interact with the iPad and how children as young as 3 and 4 come to expect to reach out to their parents or loved ones at any time through our always-on connections. Congratulations to Jason and his team for another successful Launch conference — it’s become perhaps the best venue to see top-flight emerging startups that have the potential to be game-changers. On Friday I flew down to Anaheim to give a 90-minute presentation, “Communicating in a Networked World,” to a packed room of about 250 attendees at the California State PTA Convention. We had a great give an take about how social media can be used, by Parent Teacher Associations and other organizations, to advance schools’ and school districts’ business goals. I present at a lot of workshops and it was great to see the amount of interaction throughout the session — not just questions to me but PTA reps pitching in to help their colleagues. Topics covered Facebook, Twitter, storytelling, Pinterest, Scoop.it, community strategies and more. More than half the workshop was spent on Facebook — probably 80 percent of the PTAs in the room had a Facebook page, compared with 20 percent that had a Twitter account. Multimedia storytelling can be an incredibly powerful tool for your organization to attract funders, motivate volunteers and demonstrate the power of your message. Our friends at Matanya’s Hope asked us to create a visual story for their nonprofit by seamlessly blending photos and video footage that they have captured over the past several years with original interviews, music and graphics we developed. Founded in 2005 by Illinois native Michelle Stark, Matanya’s Hope is a nonprofit dedicated to educating children in Kenya. Last summer I accompanied Michelle to Matanya Primary School and saw the destitution these children and their families face: severe poverty, hunger, lack of clothing. And I realized why Michelle is dedicating her life to this cause. By using B-roll – still photographs and short video clips referencing what the interviewees are talking about – you can make the video much more interesting than by solely using “talking heads” (straight interviews of people talking without any additional footage). As we are hearing Michelle talking about the children with “no shoes and torn and tattered clothing,” the still photographs visually reinforce what the interviewee is saying. B-roll also allows us to edit the interviews without a noticeable cut (“jump-cut”) in the action or picture on screen. Last night was the coming-out party for Socialbrite at the monthly NetTuesday gathering in San Francisco. 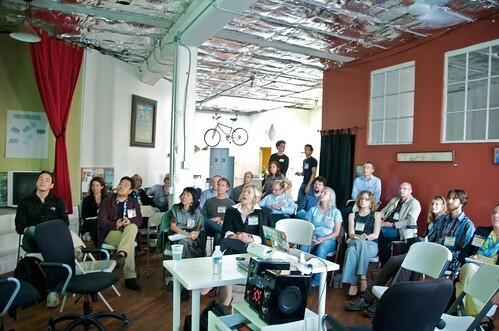 About 40 people turned out for the event at PariSoMa, the coworking space at Howard and Tenth. Here are a half-dozen shots snapped by organizer Sarah Kennon and me. And here is what the NetTuesday Meetup members had to say about the event. • I kicked things off with a rundown of the Socialbrite team and the resources offered by Socialbrite, including the Sharing Center, Social Media Glossary, Web 2.0 productivity tools, directory of social media reports, guides to free photos, free music and free video footage, and directory of cause organizations. • Jacob Colker, co-founder of the Extraordinaries, discussed the “micro-volunteer” opportunities using mobile devices in their spare time that people could sign up for. The Extraordinaries is now available as a free iPhone app. Socialbrite will publish a video interview with co-founder Ben Rigby soon. • Schlomo Rabinowitz sketched out VideoCampSF, coming to BAVC Oct. 16-17. Two days of sessions can be had for just $65. (Register here.) The stellar lineup of instructors includes Melissa Rowley, Jen Myronuk, Katrina Heppler, Sukhjit, Markus Sandy, Adam Quirk and Bill Streeter (hey, I know all these folks!). • Michael Stoll and two of his staffers came by to fill us in on The Public Press (which will be getting a new domain name next month). The nonprofit publication provides noncommercial news for the Bay Area and has been raising funds for story pitches on Spot.us. • I outlined the mission of the Public Media Collaborative, a group of Bay Area technologists, activists and bloggers who put on training workshops, chiefly for community organizations. Our next daylong workshop will be Oct. 23 in Oakland.